Bill Gates has the money. But no one motivates people and moves mountains like Bill Clinton. He's even got Rupert Murdoch onboard. A look at how the former President has borrowed from the business world to fight HIV/AIDS in Africa and other scourges. (Fortune Magazine) -- When the black SUV crested the hill and stopped near a cluster of low buildings in the desolate Rwandan village of Rwinkwavu, a crowd of people cheered and the cameras started to roll. Showtime. Paul Kagame, the tall, cave-chested President of Rwanda, alighted from the driver's seat, and Bill Clinton, thinner than he used to be and ruddy in a brightly checked shirt, emerged from the passenger's side. They were there to visit a hospital that treats people with HIV/AIDS, and Clinton was ... still Clinton. The former President was midway through a nine-day, seven-country African sprint meant to showcase the work of his William J. Clinton Foundation: conferring with the American ambassador to Chad at 5 A.M. on a runway in N'Djamena; talking politics with reporters in a Johannesburg hotel until his eyes, which these days have deep-black half-moons under them, were bleary; celebrating Nelson Mandela's 88th birthday; launching a development initiative in Malawi with President Bingu Wa Mutharika; and visiting a clinic with Bill and Melinda Gates in Lesotho, where Clinton was knighted last year. Soon it would be on to Ethiopia, Nigeria, and Liberia, but now he was in Rwinkwavu, making the rounds with Dr. Paul Farmer - a hero in the world of medicine for his work treating AIDS patients in Haiti. Last year Clinton persuaded Farmer and his Boston-based organization, Partners in Health (PIH), to bring their methods to Rwanda.This hospital was the result, and now it was time to show it off. What seemed like half the village followed Clinton and Farmer from room to room, along with the obligatory horde of reporters and some very zealous Rwandan security guards. "Make sure you meet this guy," said Clinton, gesturing toward an embarrassed Farmer. "You'll be able to say you shook the hand of the guy who won the Nobel Peace Prize." The group made its way to a ward where mothers and their sick children were huddled three to a bed; Clinton tried to make a connection with them. A bit later, outside, he effortlessly changed tone, joking with a young woman: "I'll let you be President if you'll let me be 20 years old again. No one would take that trade." As the crowd swirled around him, one petite American woman in a simple black suit chose to stay out of the spotlight. Beth Collins spent 17 years in the corporate world-director at Walt Disney Theatrical Productions, vice president at Universal Pictures, CFO of Talk Media - before giving up the business life in 2004 to become the Clinton Foundation's Rwanda country director. Now 45, she says she had always felt the call of service but made the decision to answer it (and take a humongous pay cut) only when she came across a book about the genocide in Rwanda - and realized that because she'd been traveling the world nonstop for Disney (Charts), she didn't even know there had been a genocide in Rwanda. A colleague put her in touch with Clinton, who has always regretted that he didn't do more as President to stop the genocide. Collins says she never had a moment's doubt about swapping one life for another. And so, with the support of the Rwandan government, she and Farmer came to Rwinkwavu and set about rebuilding the dilapidated clinic, a onetime Belgian colonial hospital built to service a tin mine. In 1994, the year that an estimated 800,000 Tutsis were slaughtered by Hutu militia, the hospital was abandoned and became a place where people hid and were killed. Now, thanks to funding from Clinton, Unicef, and the Global Fund to Fight AIDS, Tuberculosis, and Malaria, it is a hospital again, with a small, clean white room stacked with lifesaving antiretroviral drugs (ARVs) that hold AIDS at bay. In 2004, Collins helped the government place Rwanda's first orders for those drugs. Roughly 1,700 Rwandans receive ARVs through the program, which trains regular people to deliver and administer meds. "I've never loved a job more than this one," Collins says. "Now I can use my business experience to really do something." Welcome to the world of the Clinton Foundation - which, it should be said at the outset, is not a foundation at all in the traditional sense, because it has no money of its own. What it does have, of course, is Bill Clinton and all he brings with him: what Dr. Richard Feachem, executive director of the Global Fund, calls his "personal bully pulpit"; what Bob Carson, outgoing chairman of the American Heart Association, calls his "mind-boggling convening power"; what Doug Band, who began as Clinton's personal aide in the White House and now carries the title of counselor, calls his "ability to motivate people and move mountains." The people he motivates are an odd but potent mix of longtime allies and FOBs, doctors and activists, and executives ranging from the unknown and enormously dedicated (Beth Collins) to the high-profile and frankly improbable (longtime nemesis Rupert Murdoch, who is bankrolling a global-warming initiative). "We take a lot of cues from the business world," says Clinton, who these days can sound more like a CEO than a politician. "We have very entrepreneurial people and a very entrepreneurial process. We identify a problem, we analyze it, and we move." Much of his staff comes from business, and he says using business practices "allows us to do a lot with relatively small resources." Overseas assignments don't come with a car and driver or first-class airfare. "Your job satisfaction is not my main concern," policy chairman Ira Magaziner, an FOB for almost 40 years, likes to tell the staff. "You can sit in coach for ten hours." The foundation's 2006 budget is just $30 million; next year it will roughly double. The Bill and Melinda Gates Foundation, by contrast, has a $30 billion endowment. "Yeah, I'd like to have his money," says Clinton of Gates. "But I think our way adds value. It's kind of a pain to always ask for financing, but perhaps it forces you to look closely." "We have a culture of getting s**t done. It is very empowering and very unforgiving," says Anil Soni, a former McKinsey consultant who is now COO of Clinton's HIV/AIDS initiative. "Ira and Clinton will say, 'People are going to die tomorrow if we don't do this.' And it's true." The foundation doesn't have a clearly defined hierarchy or a detailed business plan. Its tentacles sprout from need, opportunity, and passion rather than design. "We don't have committees, we don't have processes," says foundation CEO Bruce Lindsey, who has been with Clinton since Arkansas. "If a decision needs to be made, we make it. If we can help, we help now, not tomorrow." The foundation operates a bit like a management consulting firm - burrowing into and improving the work of larger organizations - albeit one that is out to rescue the world from the dark threats of poverty, AIDS, climate change, and childhood obesity. "The scale and ambition were startling," says Mala Gaonkar, a hedge fund manager at Lone Pine Capital who gives money to Clinton. "I'm an analytical person.The foundation is very good at saying, 'Here are the outcomes, here are the metrics, here's how we've done.' 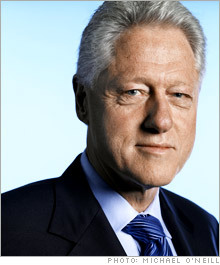 "
Since we're talking about Bill Clinton, you'll also hear criticisms. His foundation is just a way to keep the cameras and the crowds coming. He's just doing it to help his wife. He overpromises and underdelivers. He grabs credit for the work of others. He's searching for redemption. There's probably some truth to all of them. Certainly nobody soaks up the spotlight like Clinton - of course he got together with Madonna to discuss what they might do to save Malawi. And inevitably, all the showmanship can make you wonder about the substance. But to criticize is also to acknowledge that the bar is higher for Clinton than for anyone else. Instead of joining corporate boards, he's attacking many of the world's most intractable problems. He is not going for the quick hits; he's going where others haven't. And he agrees that the bar should be set high: "I believe a lot should be expected of me because I was given an astonishing life." He also says he has opportunities now that he didn't have as President. "The raw power [of the presidency] can be way oversold. There are limits to it." Unique as it is, the Clinton Foundation also stands for something larger than itself. "I am trying to do this in a way that will inspire other people," he says. "I hope the way we do things will become more the norm." Like the Gates Foundation and Robin Hood, the Clinton Foundation is part of a new turn in philanthropy, in which the lines between not-for-profits, politics, and business tend to blur. In this hardheaded philanthropic world, outcomes matter more than intentions, influence isn't measured in dollars alone, and you hear buzzwords like "scalability," "sustainability," and "measurability" all the time. As Clinton says, "It's nice to be goodhearted, but in the end that's nothing more than self-indulgence." On Aug. 14, more than 24,000 people from 160 countries gathered in Toronto for the biennial International AIDS Conference. In a cavernous convention center, attendees waited for hours to cram into a room the size of several football fields to hear Bill Clinton and Bill Gates talk about their work on HIV/AIDS. Where Gates discussed his long-term search for an AIDS vaccine, Clinton described a more immediate goal. "What I wanted to do was to stop people from dying," he said. "I thought we could do something no one else was doing, and so I did it as best I could." The Clinton HIV/AIDS Initiative (CHAI, for short) is illustrative of the foundation's work for its businesslike approach, its fearlessness, and its knack for promotion. CHAI's model-act like a for-hire blue-chip consultant and attempt to change the structure of a market rather than just dole out money - has become a blueprint for the foundation as a whole. CHAI employs 491 of the foundation's roughly 570 employees, about half of them volunteers. It's also where the whole enterprise got its start. When Clinton left office, he didn't have a master plan. There were only a handful of people working on raising money to build his library and a lot of requests. "Every board, every bank, every hedge fund wanted him," says Band. "But he is not a corporate animal. He's a public servant." After leaving office some $10 million in debt, in the past five years Clinton has made over $30 million giving speeches and more than $10 million as an advance for his book, My Life; a deal with businessman Ron Burkle could yield him tens of millions more. In 2002, Clinton went to Barcelona for that year's International AIDS Conference, and Dr. Denzel Douglas, the Prime Minister of St. Kitts and Nevis, told him, "We need your help." Douglas said that if the destruction being wrought by AIDS wasn't stopped, any other effort to alleviate poverty would be useless. "I didn't have a clue what I was agreeing to," Clinton said in Toronto. "We had a total of 12 people in Harlem, and we couldn't even answer the mail." The problem is immense. In sub-Saharan Africa, where perhaps 70% of the world's infected people live, in some countries more than 20% of the adult population is HIV-positive. The health-care infrastructure is minimal to nonexistent in many places, and annual incomes are less than $200 a year. As recently as the late 1990s, the prevailing attitude toward the explosion of HIV/AIDS was that it was basically hopeless. Antiretrovirals cost upwards of $10,000 a year. The multinational pharmaceutical companies that owned the patents on these drugs were reluctant to lower their prices. "For the first 20 years of the known epidemic, from 1981 to 2001, we did very little," says Feachem, head of the Global Fund. "We denied, we minimized, we grossly underfunded." As President, Clinton admits, he defended for too long the patents of Big Pharma companies against cheap competition from generics. But he rejects widespread criticism of his administration's HIV/AIDS efforts, arguing that he was stymied by the GOP-controlled Congress. "I think I did do a good job," he says. The dismal global picture had begun to change well before 2002, when Clinton got involved. No one in the deeply politicized global AIDS community will ever agree on the impact of any given initiative, but certain things indisputably happened. In no particular order: Activists, particularly Nobel Prize-winning Doctors Without Borders, began to protest the high price of drugs. Indian generic-drug makers, led by Cipla, began to make cheaper generic ARVs. The major pharmaceutical companies agreed to provide their drugs at what they say is no profit to the poorest of countries. In 2001 the Global Fund was started, and its billions provided major purchasing power. In January 2003, George W. Bush announced that the U.S. would commit $15 billion over five years to "turn the tide against AIDS in the most afflicted nations of Africa and the Caribbean." Clinton decided to take on the price of ARVs and dispatched his longtime aide Magaziner to look at the problem. By 2002 the most common ARV, the three-in-one pill that patients took twice a day, was being sold for as little as $250 to $500 per person per year, and for much more in some places. Magaziner thought that was all "outrageously expensive." Magaziner and Clinton were Rhodes Scholars together. A former management consultant, Magaziner became a key architect of Hillarycare, and after that blew up, he pretty much disappeared from public view. But these days he seems to be everywhere. With his intense eyes and rumpled olive-green suits, and usually fresh from a 20-hour flight in coach, he has something of the mad scientist about him. "He's not a charmer and not a politician, but he's the genius," says Basil Stamos, a doctor whose family helps fund the foundation. Magaziner called in a network of volunteers, some of them donated by McKinsey, and had them dissect the supply chain for ARVs. "There are a lot of little things that come naturally to someone with a business background," says Magaziner. As it turns out, much of the cost of the drug is the raw materials. He first went to Big Pharma to discuss how they could reduce their costs, but he says they weren't interested. ("Ira came to see us to offer to help us work through our supply chain," says one pharmaceutical executive. "We had already scrubbed the numbers. We understand our supply chain.") So Magaziner turned to India. Generic-drug makers like Cipla were already starting to crack Big Pharma's monopoly. Magaziner's team got all the suppliers to agree to lower their prices to the point where they would lose money in the first year. They did so in part because CHAI guaranteed them certain volumes. In late 2003, CHAI announced that it would make the most common AIDS drug available for less than $140 a year via agreements with four generic-drug companies. In Toronto, Clinton described CHAI's accomplishment this way: "Four years ago, first-line generics cost about $500 a person a year. So we set out to organize a drug market to shift it from a high-margin, low-volume, uncertain payment process to a low-margin, high-volume, certain payment process.... We were able to lower the price to just under $140 a person a year." He also said that over 400,000 people in almost 60 countries are now getting ARVs under his foundation's agreements. The foundation has also negotiated price reductions for pediatric drugs and HIV tests. When Clinton says, "We reduced the price from $500," that's a royal we-it includes the contributions of drugmakers like Cipla and groups like the Global Fund. In response to such criticism, the Clinton Foundation provided Fortune with a spreadsheet showing that between 2003 and the present, it arranged for the purchase of $72 million worth of ARVs, at an average price of less than $140 for the most common three-in-one combination. Nor does that number tell the whole story. As Cipla's Dr. Hamied puts it, "Clinton has played a major role in giving companies like Cipla credibility, for which I will always be grateful." Other key players agree. "Our folks have gone out and looked very closely," says Joe Cerrell, director of global health advocacy at the Gates Foundation. "There's no question that the work and the accomplishments have been dramatic." The Gates Foundation has already given Clinton $750,000 and is evaluating two more grants. "We're fundamental believers in the model," says Cerrell. You'll also hear that the publicity Clinton generates is disproportionate to the size of his work and obscures the contributions of others-although this may be inevitable, given who he is, and may do more good than harm, since he aims the spotlight on such worthy causes. In Toronto, Stephen Lewis, the UN special envoy for HIV/AIDS in Africa, recounted how he went to Magaziner "almost begging him to intervene" in Lesotho, a tiny, landlocked kingdom that is surrounded by South Africa and has one of the highest rates of HIV/AIDS. "Within one month-I repeat, within one month-the Clinton Foundation had signed a memorandum of understanding with the Ministry of Health," said Lewis, contrasting CHAI's urgency with other organizations that moved "with supernatural acceleration from inertia to paralysis." In addition to funneling low-cost ARVs to Lesotho, the foundation has helped pay for the refurbishment of a pediatric clinic near Maseru, the capital. In gratitude, King Letsie III last year dubbed Clinton a Knight Commander of the Most Courteous Order of Lesotho. In July the Maseru airport - which can be used only during daylight because the landing strip has no lights - was festooned with banners for Clinton's arrival. What you wouldn't know from all the hubbub is that others are working in Lesotho too. For instance, back in 1999, Bristol-Myers Squibb (Charts) announced it would donate $100 million over five years to five African countries, including Lesotho. In December 2005, BMS, along with the Baylor College of Medicine, opened a pediatric clinic that's also in Maseru. When the Secret Service did their advance work in Lesotho before Clinton's visit, they chose the BMS-Baylor clinic as the place to have doctors on standby if Clinton should fall sick. "No one has star power like Clinton," says Dr. Mark Kline, president of the Baylor International Pediatric AIDS Initiative. "But the casual observer might be led to believe that no one else is doing anything, and that may draw resources away from others. They're doing great stuff, but they're one of a number of groups that are doing great stuff." In Toronto, Clinton also announced that his goal was "universal access [to ARVs] by the end of the decade." It is almost impossible to comprehend the enormity of that goal - the billions that would be needed to pay for drugs, delivery, training, and infrastructure. In one small instance, Dr. William Bicknell, a professor at Boston University who also works in Lesotho, calculates that Lesotho will be able to treat up to 45,000 people a year with the roughly $9 million it is expected to have available. But upwards of a quarter-million people in Lesotho will need treatment by decade's end. That Clinton would even say "universal access" may hint at his messianic streak, but it's also a measure of how much things have changed in a very short time. "There was anger and recrimination," says Feachem. "Now there is hope and ambition." Everyone agrees that what has made the difference is access to treatment. Old prejudices, such as the notion that poor people couldn't be trusted to take their pills regularly, have been proven false. As Clinton said in Toronto, "They'll live if you give them the tools to live." But even Clinton acknowledges that treatment alone will never be enough. "I think it will be a rocky road until we have a vaccine or a cure," he told the crowd in Toronto. At a small dinner party last year in London, a dapper, goateed Scottish entrepreneur named Sir Tom Hunter found himself seated next to Clinton. Hunter, who sold his sneaker empire for $500 million in 1998 and is now the richest man in Scotland, soon found himself in Africa. After late-night discussions about the intertwined nature of the forces that make poverty such an intractable problem-Does health care help people who don't have clean water? Does clean water help someone who is starving?-the two decided to launch an integrated development program in Rwanda and Malawi. The goal of the Clinton-Hunter Development Initiative, or CHDI, which even Clinton admits is "pretty brassy," is to double per capita income within ten years. Hunter is committing $100 million over a decade; Clinton is lending his name and the manpower. Already, Magaziner has had people out riding the trucks that distribute fertilizer in order to figure out how best to reduce the cost, just as they did with ARVs. "Clinton speeds things up," says Hunter. "We don't have to wait to see if someone takes our call. Our goal is to take the dependency out," he adds. "We absolutely want to put ourselves out of business." In addition to his physicians, saints, and Scottish entrepreneurs, Clinton also has his Wall Street supporters, including money management firm Sterling Stamos. Sterling Stamos, which manages over $3 billion, is set up so that 10% of the general partners' profits go to charity. Chris Stamos, a partner in the firm, says he decided to commit money to Clinton when, along with Tom Hunter, he accompanied Clinton to Africa. The defining moment came in Rwanda, when a local reporter asked Clinton about his administration's failures during the 1994 genocide. "It didn't happen under my administration," Clinton replied. "It happened under me." "It was so unpolitical," says Stamos. Just a few weeks after Clinton returned from his 2006 trip to Africa, he was at a press conference-yes, another one-in Los Angeles. Accompanied by British Prime Minister Tony Blair, he announced his latest initiative: an attempt to tackle global warming by working with the world's 20 largest cities to help them reduce emissions and buy energy-friendly products such as efficient lighting more cheaply. The $3 million in funding is coming from three donors: Anson Beard (one of the retired Morgan Stanley executives who played a role in ousting CEO Phil Purcell), Barbra Streisand-and Rupert Murdoch. "I'm quite sure it's the only time that Rupert Murdoch and Barbra Streisand have done anything together!" says Clinton. Few have been tougher on the Clintons than Murdoch's New York Post, but recently the camps have been cozying up; Murdoch even hosted a fundraiser for Hillary. Murdoch "has the same right to his opinions that I have to mine," says Clinton. "It would be hypocritical of me if I weren't willing to work with people who have opinions different than mine." He laughs. "It was said of me when I was governor that I'd never remember who I'm supposed to hate one day to the next." What with global warming and the worldwide HIV/AIDS pandemic, you might think Clinton has his hands full. Then you meet Bob Harrison, a former Goldman Sachs partner who now spends most of his days in a cramped room in Clinton's Harlem office. The little space is dominated by a giant posterboard that says ALLIANCE FOR A HEALTHIER GENERATION. After Clinton's quadruple-bypass surgery in the fall of 2004, the American Heart Association called to see if he'd do a public-service announcement. Clinton responded that he wanted to do something that had measurable results, and in May 2005 his foundation and the AHA announced the alliance, which has as its grand goal stopping the increasing prevalence of childhood obesity by 2010. It's a personal issue for Clinton-he battled his weight as a child, and his ongoing struggles with diet have been exhaustively chronicled-but it is more than that. Childhood obesity could cause this generation of Americans to be the first in history with a shorter life expectancy than their parents. The economic consequences are staggering. Like most of Clinton's projects, the alliance is both immensely ambitious and embryonic. This spring Clinton held-surprise!-a press conference to announce a deal he had struck with the beverage industry to limit the amount of sugar and calories in drinks sold in schools. Harrison is now negotiating a similar deal with snack-food makers, and other parts of the plan, such as helping health-care providers better treat obesity, are underway. "This is as intense and urgent as almost any period of time at Goldman Sachs," says Harrison, who worked for the John Kerry campaign after leaving the firm. He does not take a salary. Clinton's beverage deal has already come under fire from a wide range of activists, lawyers, and academics, who say he simply swiped the groundwork laid by a grass-roots movement, and that he has been used as a handy public relations tool by soda companies desperate to avoid the very real threat of litigation. When you look closely at the agreement, it's all voluntary. States such as Connecticut have passed legislation that goes further. "Industry went looking for someone like Clinton to make it look like they were doing something good, when in reality they were being forced into it," says Kelly Brownell, the director of the Rudd Center for Food Policy and Obesity at Yale who was recently named one of Time's 100 most influential people for his work on childhood obesity. "I'm not surprised that Bill Clinton would do something to grab the spotlight," says Michelle Simon, the founder of the Center for Informed Food Choices. The deal with the soda companies showcases another key tenet of the Clinton Foundation-its determination to work with, not against, industry. "The foundation's approach is to be very conscious of economic realities. We're not trying to put anyone out of business or even do damage," says Harrison. Says Clinton: "I never ask any business to lose money. What we need most in AIDS, in climate change, in health care, is for them to reexamine the premises on which they operate." He cites Wal-Mart's move to a greener business model as a key example of doing well by doing good. The alliance's work may help test the limits of that old saw. Everyone who works for the Clinton Foundation insists that "no" is part of the vocabulary-after six months of research, for instance, they decided they didn't have the resources at this particular time to fix the world's water and sanitation problems. But you can't help wondering about their level of self-awareness when Band says, with apparent sincerity, "We believe we'll have way more impact if we focus on a few things specifically rather than a lot of things broadly." They seem to be spread thin, but from their perspective, maybe they're being incredibly selective. Band, with his ever buzzing BlackBerry, a letter from Mandela on his desk, and an e-mail from Spielberg in his in-box, says that the foundation receives 5,000 pieces of mail a week, 20% of them requests for help. "If it's a malady the body can have, they've come to us," says foundation CEO Lindsey. If it all sounds a bit grandiose, could it be any other way? As Lindsey says, "It's the nature of the beast. We work for a man who sees big problems and wants to tackle them." Clinton's office is an oasis of calm. Lining the windowsills and covering the walls are framed memorabilia and photographs. It seems more like a museum than a working office, and indeed, Clinton isn't there often. He travels roughly half the year, and when he's in New York State he works mostly out of Chappaqua, spending one day a week in the Harlem office. Clinton's health problems in the fall of 2004 don't seem to have slowed him down. He looked exhausted in the wake of his surgery but now appears fit-and remains absurdly active. In addition to the foundation, there's the Bush-Clinton Katrina fund, his work as the UN's special envoy for tsunami relief, and-oh, yes-politics. It is an election year, after all, so his calendar includes time for campaigning. "I knew I would want to help as much as I could," Clinton says. And then there are the things that just pop up, like today's meeting with a Make-A-Wish child whose wish was to meet Clinton. ("He's so smart," says Clinton. "He's read all the books I have.") He also finds the time to read four or five books a week. On the trip to Africa, he talked constantly about Robert Wright's Nonzero. ("It contradicts people's sense of themselves to have to share the future with the other," Clinton said. "But there is no conceivable alternative.") Of course, he also golfs, although he says, "If I played more than once a week, I'd get bored." Clinton says he spends more than half his time on the foundation, and he's trying to get to the point where that's all he does. "I don't see how we could have exploded this any faster and had more impact that we have," he says. "We started with me, a handful of people, and $10 million in debt." When asked if he has any fear of failure, he says, simply, "No." Then he offers a line that you might hear from a motivational speaker. "If you try enough things and are ambitious enough, you're going to fail at some. The thrill of this is trying to do it." He insists that his foundation is not an attempt to atone for past sins or compensate for lost power. "I promised myself when I left the presidency that I would not spend one day sitting and moping and wishing I was still President," he says. He repeats a variation of this a little too often for it to be believable, though, and while he'll discourse on the limits of presidential power, he also recounts a telling anecdote. Someone recently asked him if he thought he would wind up doing more good as a former President than he did as President. "Only if I live a long time!" he said. In truth, no explanation of Bill Clinton's motives can do them justice. Is he trying to help Hillary by generating goodwill and building support among both Republicans and Democrats? He'll deny that Hillary needs any help. He is sensitive to charges that he didn't put a stamp on his time as President, and he acknowledges a few failures-about Rwanda, he says, "I do think I have a debt there, and I don't think it can ever be fully discharged." But if he has any sense of mission not accomplished, he won't admit to it. Clinton casts his motivations in moral and religious terms-and frequently mentions his own mortality. In a speech a year ago, he said, "It will benefit us economically if we do this. But we need a little humility here. If we really have our religious teachings grounded, well, we will do this because it's the right thing to do." He also said, "I've reached an age now where it doesn't matter whatever happens to me. I just don't want anybody to die before their time anymore." In Harlem, he picked up a picture of himself and Hillary back in Arkansas. "I was only 39 then, and I didn't look it," he said. "I didn't look my age until I was 45, and then it all went to hell." He's been saying things like this since 1996 or so, when he seemed to realize that his graying-now white-hair lent him a gravitas he'd lacked. But after quadruple-bypass surgery, who can say he hasn't earned it now? Flying through African skies after a long day in Malawi, Clinton went on another extended monologue about his motivations. "Always in my life, I've had a consuming interest in people, politics, and policy. I'm out of politics now except for whatever use I am to Hillary. But I'm not out of people and policy. My primary motivation is that I love this stuff." For the people in Malawi, he said, there was but one choice: to work to live. "That's the way 99% of people in human history have lived. If you're in that narrow class who can live to work, you are privileged not just now, but in any single moment that ever existed." He added, "If you can do something that makes a difference, you have a moral obligation. But it's not a burden, it's a joy. I think those are my motives," he concluded. "But who can really know?" Joan L. Levinstein contributed to this article.